All numbers including comparative periods are as per IndAS accounting standards. The Company evaluates the profitability of its segments based on Operational EBITA. Operational EBITA represents income from operations excluding: (i) amortization expense on intangibles, (ii) restructuring and restructuring-related expenses, (iii) non-operational pension cost, (iv) gains and losses from sale of businesses, acquisition-related expenses and certain non-operational items, as well as (v) foreign exchange/commodity timing differences in income from operations consisting of: (a) unrealized gains and losses on derivatives (foreign exchange, commodities, embedded derivatives), (b) unrealized foreign exchange movements on receivables/payables (and related assets/liabilities). Total orders grew in the fourth quarter by 44 percent and in 2017 by 19 percent, excluding the exceptionally large UHVDC order and the large traction transformer orders booked in 2016. Orders in the second half of the year benefited from reviving industrial activity; however, base orders developed well throughout 2017, and short cycle activity was strong. Export orders reached an all-time high in the year, significantly more than doubling in 2017. Major orders were secured from both domestic and international customers, comprising propulsion equipment for railways in India, and substations for electric transport from South East Asian countries. The efforts in getting customers digital-ready yielded results in 2017 with smart factory pilots, including remote monitoring solutions, established across several sectors including cement, paint, pharma, oil and gas and two-wheeler manufacturers. Orders received for the fourth quarter were Rs 2911 crore. The order backlog of Rs 11,534 crore, as of December 31, 2017, notwithstanding the absence of the exceptionally large UHVDC order, provides solid visibility for future revenue. ABB India’s revenue for 2017 was Rs 9087 crore. All divisions contributed, aided by stabilization and selective improvement in end-customer markets including ports, process industries, mining, refining and emerging markets such as food and beverage, smart cities and metros. The company closed the year with a solid cash performance across all four divisions, reinforcing the mantra of cash over revenue for a balanced growth. Profit before tax (PBT) increased by 8 percent to INR 622 crore and profit after tax (PAT) by 12 percent to INR 420 crore compared to the prior year period. The Board of Directors has recommended a dividend of Rs 4.4 per share (220 percent), subject to the approval of shareholders at the forthcoming Annual General Meeting. 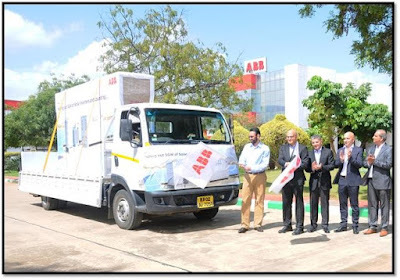 Jean Christophe Deslarzes, Head of Human Resource, and member of Executive Committee, ABB Group has been appointed as the non-executive non-independent director and the chairman of the board of directors for ABB India Limited. He succeeds Frank Duggan, who has resigned from the position of chairman and he has taken over a new role as the President of the Europe region, ABB Group.